The Admiral is a minor character from a Star Wars film. Although he presumably has a life beyond the few scenes in which he appears, he is remembered for one thing and one thing only. 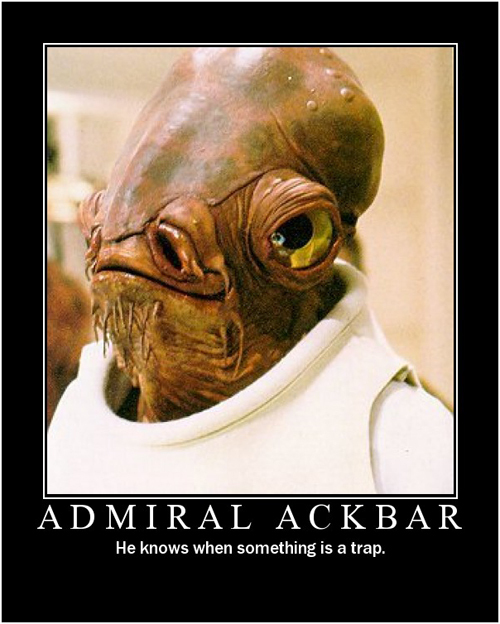 Admiral Ackbar, the ever-useful trap detector, was absent in the days of Jesus Christ. Fortunately, the Lord was shrewd enough to detect a trap without the advice of Star Wars characters. Quite a number of people disliked Jesus, you see. Two religious groups, the Pharisees and Sadducees, hated the way his teachings upset the balance of things. They wanted him gone—disgraced—dead. These religious groups resorted to all kinds of underhanded traps to bring down the controversial upstart called Jesus Christ. I find it hilarious, and extremely impressive, how the Lord Jesus dodged every trap with bravado and brilliance. It happened again and again. Even without Admiral Ackbar’s insight, the Lord Jesus never fell for a trap. The priests demanded to know who gave Jesus his authority. If he claimed it came from God, they could accuse him of blasphemy. If he gave some other answer, or simply refused to reply, they could claim his teachings carried no weight. “Is it right to pay the imperial tax to Caesar or not?” demanded the Pharisees. If he answered “Yes,” they could accuse him of being a sellout to the Roman authorities. If he answered “No,” they could get him into trouble with those authorities. The Sadducees added a trap of their own, but Jesus kept his cool. If a woman is married more than once, they asked, whose wife will she be in the afterlife? By this question, the Sadducees (who didn’t believe in life after death) meant to discredit Jesus and his teachings. If Jesus said the woman should die, he would break Roman law. If he said the woman should live, he would break divine law. There was no way out. It was a trap even Admiral Ackbar could not avoid. Go ahead, said Jesus. Execute the woman according to Jewish law—but let someone who hasn’t sinned begin the execution. “No one, sir,” she replied, perhaps trembling in fear and awe. I find it fascinating that Jesus gave tricky answers only to trick questions. When a Pharisee finally asked him a fair question, Jesus’ answer was honest and straightforward. What, asked the Pharisee, is the greatest commandment in God’s law? Love God and love others, answered Jesus. That, dear readers, is not a trap. This post was originally published on May 29, 2013. TMTF shall return with new content on November 30, 2015! This entry was posted in Geeky Wednesdays and tagged Bible, geek studies by Adam Stück. Bookmark the permalink.